Many governments have over the last few years taken an interest in the use of games and playful strategies for interacting with – or even ‘empowering’ – their citizens. “How can we use games for civic purposes?” is the main research question for designers working in this context. When Eric Gordon visited Amsterdam for a lecture and workshop (co-organized by the Free University, NICA, Freedom Lab and The Mobile City) just before the summer, he challenged us to turned that question around: Don’t ask how are games working, but rather: how are games working us. What he means is that the design of games and/or playful strategies include particular notions of what relations between governments, citizens and third parties such as developers should be. Likewise their gameplay usually departs from a particular interest or take on the case that’s addressed in the game, usually the vision of the party that pays for the development of the game. Civic games are not by definition an open arena for debate, but may reflect (and reinforce those, rather than empower citizens) existing power structures. An important aspect, Gordon brought out in this regard was the difference between ‘gamification’ and ‘engagement’. Gamification is usually used as a term to make a particular situation more playful, in order to nudge users/players to a particular behavior or a desired outcome – one that is beneficial to the provider of the game. In other words, the agenda is already set and a behavioristic strategy is employed to motivate people to carry it out. Engagement or empowerment on the other hand, is a strategy to include play to empower users to set (or at least influence) the agenda themselves. With this in mind, an interesting question for game researchers and designers is exactly the way these kinds of power relations are codified into the rule set and gameplay of civic games. To turn the question around like this, of course doesn’t mean that the first question (how do games work) has become irrelevant. On the contrary. There has been a healthy debate over what exactly constitutes a game with different definitions provided by, among others, David Parlett, Clark Abt, Roger Caillois, Bernard Suits, Chris Crawford and of course Johan Huizinga. All of them include a ‘magic circle’ a directed activity, with clear goals and objectives and a formal system separate from everyday life, where participation is strictly voluntary. The idea of games as empowerment tools is also nothing new. Already in the 1960’s there was already a movement in game design on serious games, such as the games developed by Clark Apt and the ‘New Games movement’ which aimed at replacing competitive games with collaborative ones. However during the 1980’s, Gordon explained, games were associated with mindlessness and delinquency, while in the 1990’s, the rise of video games caused a widespread concern about representations of violence and their effect on children’s behavior. This dominant narrative of doom and violence, started to change at the beginning of this century, leading to a positive framing of games by the mid 2000’s and the emergence of ‘gamification’; a term coined in 2011. Jane Mcgonical a key figure in the gamification discourse inspired the instrumentalisation of gaming in business, associating play with behavior modification. Now games become a means to an end, for both businesses and governments. It could seduce people to participate. But to what extent is this participation indeed true engagement and empowerment? Gordon has himself experienced the tension between ‘gamification’ and ‘engagement’ or ‘empowerment’ at work in the design of civic games in the various projects he worked on. 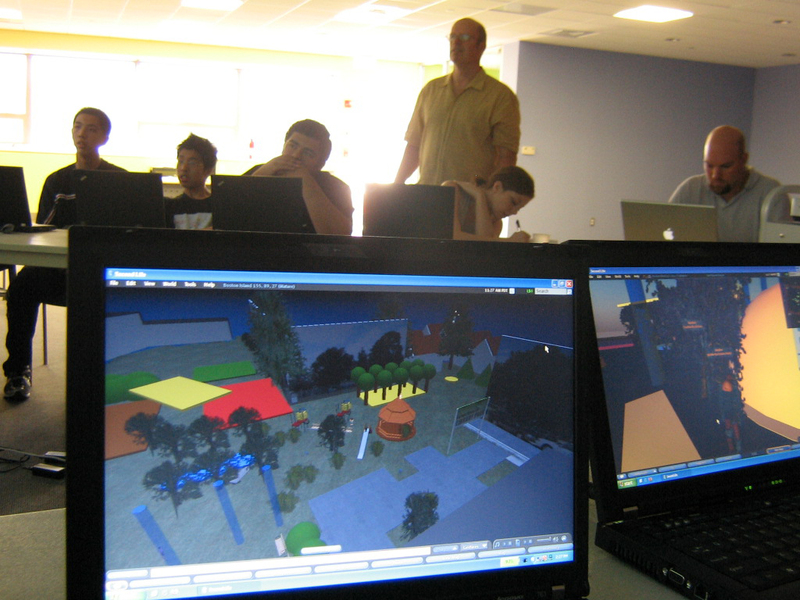 Going through his past projects in Emerson College’s Engagement Lab, Gordon mentioned his early occupation with Second Life and the city of Boston. People would reconstruct cities online, which were destined to remain empty. With the Hub2 project they created an “augmented deliberation” process through which citizens could use Second Life to discuss spatial issues. The promise of these games on the level of ‘empowerment’ and ‘engagement’ is that they provide a way out of traditional citizen engagement process, that consists of obligatory town hall meetings, where citizens may voice their complaints, yet at the same time leave with the feeling that their comments are ephemeral and may not be heard or taken into account. A game addresses this by providing a constructive arena in which people can’t only complain, but also come up with alternatives. More importantly: it provides recordable input that can be forwarded to the city and planning committee. Ideal as that may sound; in reality the dynamics are more complex. It starts with the motivation of organizations to employ games as a strategy. Are they truly interested in ‘citizen input’? Or is just a way for them to show that they are an innovative organization, and a way to soften the relation between local communities and outside developers with their future plans? Then, there is a tension over power and control between the designer and the player. In a game both sides think they are in control of the process, the designer because he defines the context and creates the borders within which the user can operate and the user because he can use the system for his own ends. This tension became operative in one of the games Gordon participated in the design. Citizens where invited to use the game arena to come up with alternative plans for their area. However, the architects involved prohibited that these input would be called ‘designs’. After all they were the official designers, and they did not want to give the citizens the idea that they were going to design the area. Instead, their input had to be called ‘sketches’. Next, there is a tension between serious and playful, with the line between the two being evermore blurred. It might well be that in the framework of a game, established hierarchies can be momentarily escaped but a game might also threaten the seriousness of a civic process. It is very hard to think of a game as an efficient process because it simply isn’t one! Sometimes, increasing efficiency by creating clear, prescribed tasks and paths to actions may make the game process uninteresting for the participants. Gordon’s conclusions regarding these tensions address the desire for control during the gaming process by considering it implicit in the work games do and by trying to negotiate seriousness and play throughout the process. The balance between efficiency and inefficiency is what determines how games work and the effects of games extend well beyond the moment of play: internal games can change organizational dynamics within a company or organization while external games can define its identity. And perhaps the most important argument for using games remains: it gives people the permission to play, to step out of character, and that can open up new opportunities. The day following the lecture, we had a workshop with Eric Gordon on urban gaming and civil participation on digital media platforms, hosted by Jeroen van Mastrigt from the Freedom Lab and introduced by Ginette Verstraete (VU), Martijn de Waal and Michiel de Lange. Central aim of the workshop was to discuss the possibilities of using games to collaboratively address complex urban issues. A multidisciplinary group of about 20 from the fields of game design, urban design, media institutions and academia came together to discuss the potential uses of gaming, working on four questions. When is it a good idea to translate a societal issue into a game, and what can a game contribute to the understanding of the issue and finding a solution for it? The first group had to discuss when using games is a good idea, what kind of questions can games address and who is involved in this process. The participants observed that not all problems can become game-cases; only the ones that involve systems, rules and procedures. A major profit that games can offer is to change players’ perspective on an issue by allowing players to adopt different roles within the game. The behavior that the player adopts within the game can be extrapolated to his actions outside the game. For this group this also expresses the difference between game and play. While the first one is about giving insights into complex systems, the second is about creating a personal perspective through the act of playing. 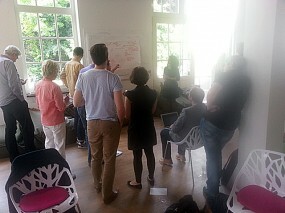 How can we engage citizens to become active participants in civic games? The second group had to define when people allow themselves to play, what draws them in games and how games can become inclusive. As group 1 concluded, what gaming can do is to create collective moments of interaction and instigate new perspectives and reframing of the issues at stake. But under what conditions are citizens interested in taking part in such playful activities? This group concluded from their experiences that people tend to resist participating in processes that are imposed by the top so games should be developed from within the communities. So communities at large can adopt conditions and rules that have been formed in the environment of a game, through playful events. Finally, games can create new, shared rituals, which have always been an important aspect of community building. How do we translate a particular issue into a game or playful situation? What is the role of institutions, designers and citizens in this process? Once we have addressed a particular issue, how do we turn it into an engaging civic game? Gaming can be great as an event that brings communities together and allows them to deliberate but in order to be part of a larger planning process, gaming must also deliver certain results. The third group had to approach the issue from the perspective of institutions involved and examine how gameplay can lead to a design and what is the role of designers and organizations in framing the issues and structuring the gameplay. The most important issue that arose from this group was the necessity of trust between the organization that creates the game and the community that is invited to play. Very often games are employed because they look cool or as an excuse for institutions to show that they are open to society. But for people to engage in a game, as in every other participatory process, there must be a clear outcome and plan of how their input will be used. This is the role of the game designer who must balance the control over the process with the control left to the players. How do games lead to action? on a social level they can mobilize people for activist purposes. on a political level they can simply lead to informed citizens that are involved in society, give them a broader perspective on issues at stake by role playing games. on a personal level they can assist people with getting familiar with certain processes as for example taking their medication. Again, as pointed out in Gordon’s main lecture, the difference between gamification and empowerment came up. Gamification is utterly about seducing people into something, being a behavior, a future condition or a personal habit. But games can be even more meaningful when they create a process for players to decide which are the issues they find important in the first place. In short, games will not change the world but they can contribute to creating new collectives, give insight into societal conditions and interests, testing out scenarios in playful situation, and aligning language among involved parties. Collective closing remarks centered around the necessity for better evaluation tools about games, more practice-based experiments and the need to operationalize creativity, namely to create transmittable knowledge out of a creative process. As play counterbalances the utilitarian view on media use, maybe games can offer a good motivation to rethink the efficiency-oriented technology of today.